Update: I’ve owned the Caribee Fast Track Wheeled Backpack for over a year now and I still love it. I test out a lot of backpacks and suitcases and this is still my favourite. I can’t recommend it enough for long journeys, backpacking or any trip where you need a large case! 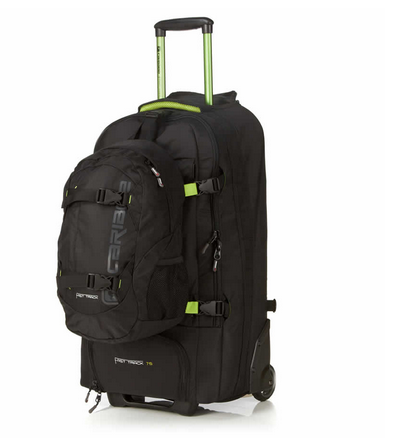 For my last few trips I’ve been using the Caribee Fast Track Wheeled Backpack 75L . 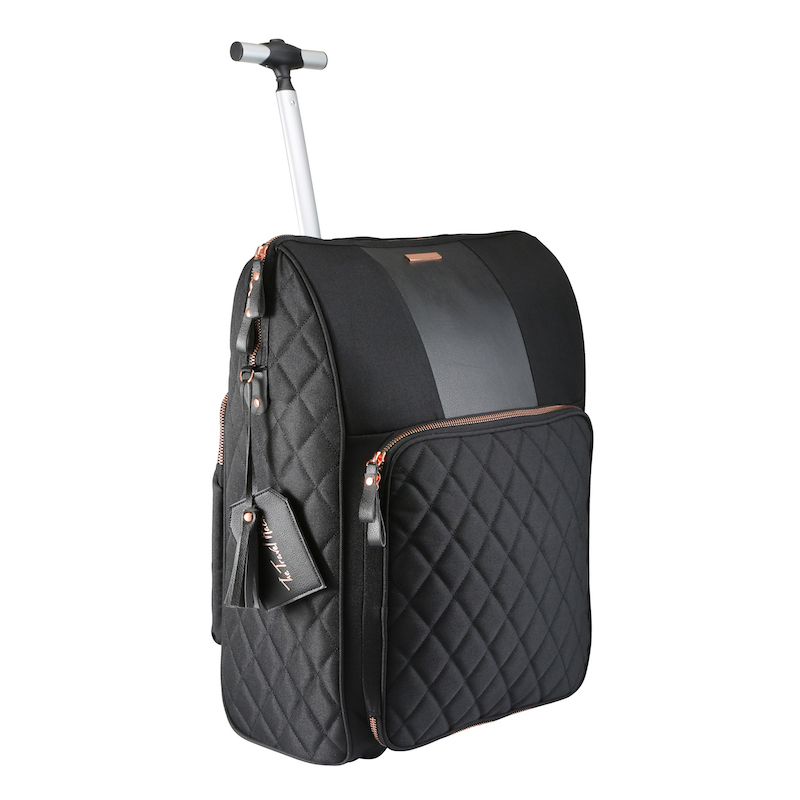 I’ve been looking for a wheeled backpack for a while now to give me the flexibility of wheeling or carrying my luggage. If you’re going backpacking, this is a massive bonus. The pack also has a detachable daypack which is perfect for your hand luggage or a separate compartment for dirty shoes or maybe things you want to access quickly. When I first went backpacking through Asia and Australia I had a traditional backpack and I hated it. It was difficult for me to carry and, in two whole years, there were less than 20 times when I actually needed to carry it. The only time I really needed to carry my backpack was when I was staying in a beach hut which would have meant dragging my bag across the sand. Getting on and off boats would have been awkward too. Everywhere else it’s fine to wheel it! 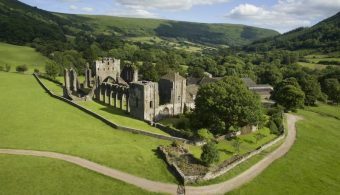 Even if you plan to ‘get off the beaten track’ there’s still going to be a fairly smooth track for your wheels. I travel a lot but I actually very rarely need a backpack. I’m fairly small so I find it difficult to carry a heavy backpack and would much rather wheel a suitcase. Having said that, there are times when I sometimes need the ease of carrying it. Plus, let’s be honest, you don’t feel like a proper backpacker unless you have a backpack. When you’re in a queue of backpackers and you see one girl with an enormous suitcase, everyone judges her! 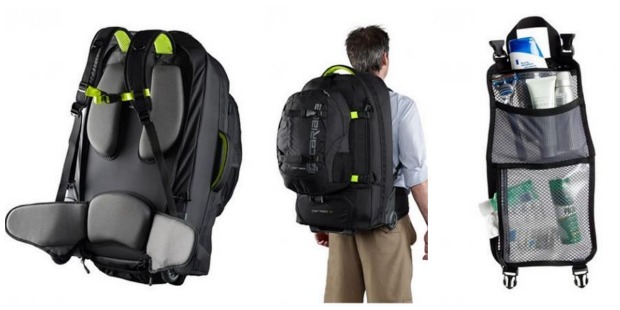 With this bag you feel like a backpacker but without the effort of actually carrying a backpack. I opted for the Caribee Fast Track Wheeled Backpack due to the size, toughness and detachable daypack. There’s also a smaller 45 Litre Caribee Fast Track Duffle which I’d definitely consider if you’re going on a shorter trip or you’re really good at packing light. Here’s the official video review. There’s a super sturdy handle that doesn’t feel like it will ever break. TIP: I previously had a top loader backpack and hated it because everything would sink to the bottom and it was impossible to find anything without emptying the entire bag. The bottom pocket is perfect for the items you need to get to everyday, while at the airport or for toiletries to keep them separate from your clothes. The inside toiletry bag is actually great for valuables and small items like jewellery. There are plenty of small inside pockets for fiddily things like cables. The detachable backpack is so handy. During my USA roadtrip I used the smaller bag for my sleeping bag, sleeping mat and towel to save space in my main bag. I could then use it for hiking and day trips when I needed to. Sometimes I use it for my handluggage and clip it to the main bag while travelling to and from the airport – there’s nothing worse than struggling with lots of bags. TIP: You can check the whole bag in with the small backpack attached. I’ve done this with multiple airlines and it’s fine. It’s much bigger than you’d think. Even when I think it’s way too full to close it will zip up like a dream. It’s the perfect size. I opted for the 75 litre and found it was just big enough for a 2-3 week trip but not so big you can over-pack and it’s too heavy. It’s really easy to convert from a wheeled case to a backpack. One of my wheels has a small chunk missing from it. This happened during its first trip and it hasn’t got any worse but I am worried it could break. It isn’t very agile and can be difficult to wheel around tight corners and will fall over if I pull it down a curb. The wheels obviously give it extra weight making it heavy than just a backpack. This is to be expected and, realistically, I very rarely use it as a backpack anyway. The Caribee goes to Sri Lanka without me! Since raving about this bag I have a queue of friends waiting to use it in between my own trips. It’s already been to Sri Lanka, Thailand and Croatia without me. I don’t think that suitcase endorsements come better than that! Massive thanks to Travel Outdoors for providing me with the case to try. All thoughts, opinions and suitcase obsessions are, as always, my own. The bag is currently priced at £149.99, discounted from £189.99. I really do think this is a great bag for adventurous travel and wish I’d had it when I travelled around Asia because it makes travelling so much easier. I’ve been looking for a stylish yet practical backpack for travel too – as much as I love my suitcase, sometimes it’s really annoying to roll it (i.e. on cobblestones or dirt road). Will have to look into this one! Definitely do. I roll it most of the time. I’m such a weakling and hate carrying my backpack but it’s good to know I can if I want to. I considered this backpack for my most recent trip (6 months in Eastern Europe) but it’s a bit big to carry comfortably on my back and, well, I didn’t want to lug around 75L worth of stuff for 6 months. Hopefully they’ll bring out a 40L or 50L. I know what you mean, it isn’t the comfiest. I guess in Eastern Europe you may be carrying it up and down steps a lot? I found that while I was in Asia there were only a hand full of times when I wouldn’t be able to wheel it but the smaller the better whenever you’re going! I’ve had a wheeled backpack for as long as I can remember and absolutely love mine. The fact they zip open all the way is so useful but mine is so easy to over pack, I’ve lost count of the times I fallen over! Been thinking I need to replace mine for a while now and this one looks fab! Thank you so much for the recommendation. I’ve just bought it for my 6 month world trip, so cannot wait to pack it up and hit the road! Ah amazing. I hope you love it as much as I do and have an awesome trip! Oh man this bag seems super similar to my Osprey Meridian 22′. I love mine and they have a lifetime warrantee. Hi Monica, thanks for the super helpful review. I’m looking at these online but its hard when you can’t see them physically. I’m looking for a bag that can do for a long weekend skiing, with my ski boots and kit inside the bag (checking in to an airline but one bag only). I did this with a duffle-bag recently but taking public transport from home to work then airport without wheels was a killer! 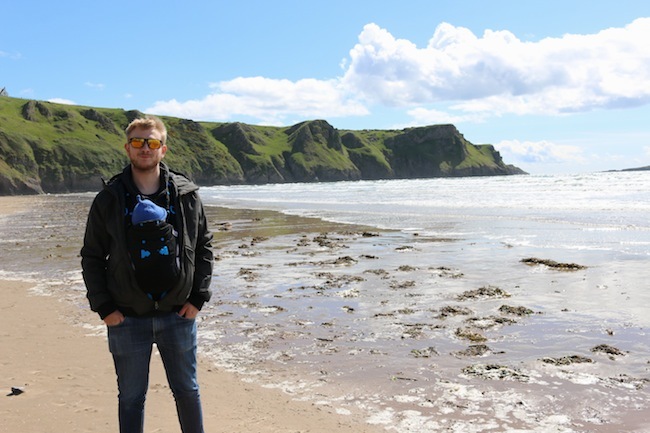 Also wanting a bag for a 4 day trip with my 1-year old that will fit everything for both of us but be manageable while pushing a lightweight travel pram too. I probably won’t need to use the shoulder straps much but like the idea of the flexibility. Would you go for 75 or 85 size?? Thinking I might have to go bigger to get the ski boots in? Thanks!! I’m so pleased you found it useful Susie! It can be tough buying things like this without physically seeing them. I’d go for the smallest size you can. I always find that if I have a bigger bag I just fill it but I can usually make do with the smaller. Ski boots are chunky though! I’m expecting a baby and I’m really pleased I have this bag for when I travel alone with him. It’s plenty big enough to fit everything but still easy enough to move around and wheel while pushing a pram too. thanks Monica, i’ll try the 75 if you think the ski-boots will fit. Congrats on the impending arrival – I travelled to Australia for a month when mine was 4 months old. Can’t recommend the city mini pram enough, one-hand fold at the gate is super useful when you are holding the baby – enjoy!! Off to Central America next year for 6 weeks and have been tossing up between the Caribee and the Osprey. A sale at my local Globetrekker store (just under $220 AUD) along with your review has made the decision for me and I’m off to pick mine up in my lunch break today. I’m excited!! Many thanks. Hi, great info! I’ve been looking at this versus the Osprey Sojourn 60 litre, which doesn’t have a daypack. I’m just wondering, I can’t find any info on how much it weighs without the daypack attached. Any chance you can get this info? Do you still recommend the bag? Thanks! The daypack weighs next to nothing. I’m not sure how much but there’s not a lot to it at all so having the day pack attached will make very little difference to the overall weight. I still love this bag. I’ve never used the Osprey though so can’t compare them I’m afraid. Hiya I’m going to Australia for a year and I am SOOOOO stuck between a suitcase and a wheeled backpack. Would you have any suggestions for me? I’d go for a wheeled backpack if you can’t decide. If you have a suitcase you can’t pick it up and carry it on your back but if you have a wheeled backpack at least you have the option. To be honest, in Australia you probably won’t need to carry it but it’s nice to have the option and it means your luggage is easier to squish onto buses or under beds. – is the 75 l volume just the big backpack or together with the day pack? Hi Simon, yes the straps can be tucked away so they’re away while you’re wheeling it or when transporting it. And I think the 75l is the entire backpack. I hope that helps!